Good news for commuters who constantly travel from Alabang to Makati and vice-versa. The Department of Transportation and Communications (DOTC) has recently launched a third point-to-point (P2P) or "non-stop" bus service traveling the Alabang-Makati route. The winning operator for the route is RRCG Transport. 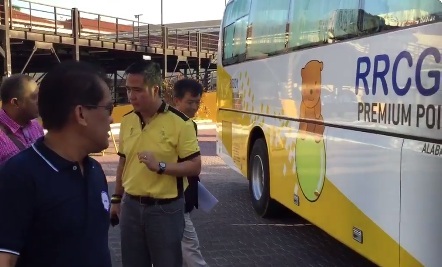 Passengers can board the express bus at pick-up points at Alabang Town Center and Greenbelt 1 in Makati. A total of 22 trips from each point will be made available to the riding public. First trip from Alabang Town Center starts at 6 A.M and last trip is at 8:30 P.M. Trips are spaced apart by 30 minutes during rush hours and by one hour during lean hours. Since P2P buses only stop at designated pick-up points and follows a fixed schedule, this reliable transportation option provides commuters significant savings in travelling time. It is also one way for the DOTC and the Land Transportation and Franchising Regulatory Board (LTFRB) to modernize the public utility bus (PUB) system. The Alabang-Makati route is the third P2P bus route introduced by the DOTC. Other P2P bus routes are Trinoma-Makati by Froehlich Tours and Ortigas-Makati by HM Transport. DOTC said another P2P bus route will be made available this week , which is the North EDSA-Ortigas route. The DOTC also said that more P2P services will be rolled out in the coming weeks like tha Alabang -Ortigas and Fairview-Makati routes.